A presentation exploring the relationship between architecture and nightlife in Italy during the 1960s and 1970s. 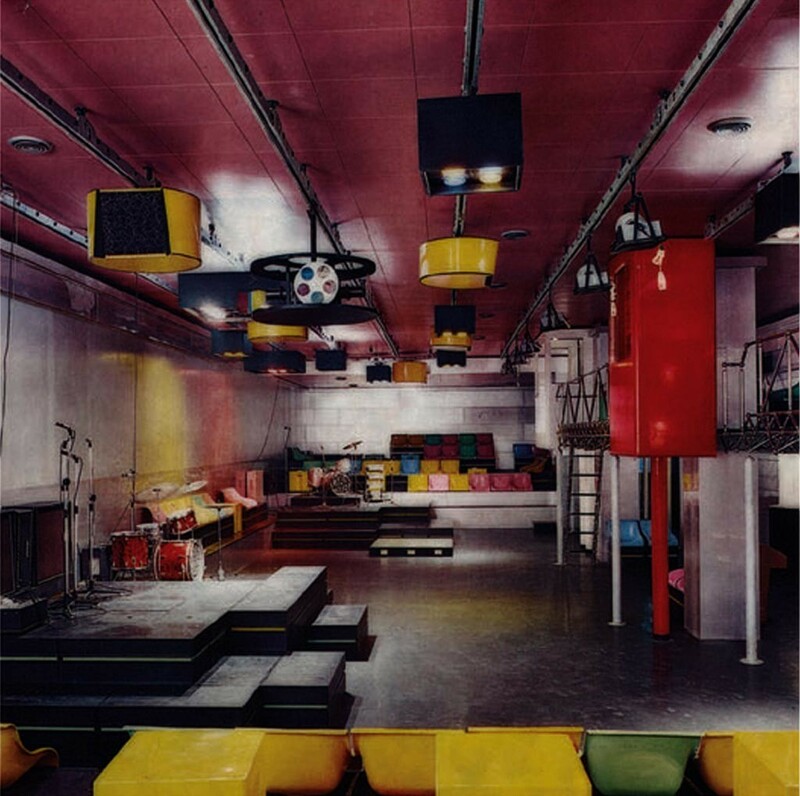 These years saw a number of discotheques open across Italy, including several designed by architects of Radical Design, a movement active in the 60s and 70s populated by architects such as Gruppo 9999, Superstudio and UFO. Dissatisfied by the limitations and ineffectiveness of post-war modern design, these architects sought to use their profession as a tool for societal change and to challenge the idea of architects’ role in society. In a period of change and contestation in Italy more generally, these socially orientated, politicised architects saw discos as a new type of space for multidisciplinary experimentation and creative liberation. The display explores this little-known phenomenon through archival photographs, architectural drawings, film, music and articles from the international design press. Italy’s discos were known as Pipers, named after the first such venue, which opened in Rome in 1965. Designed by Manilo Cavalli, and Francesco and Giancarlo Capolei it featured reconfigurable furnishings, audio-visual technologies and a stage for Italian and British acts from Patty Pravo to Pink Floyd, who performed against a backdrop of works by artists including Piero Manzoni and Andy Warhol. Pipers generated interest amongst many young architects, sparked by a course on the topic at Florence University. Participants included Giorgio Ceretti, Pietro Derossi and Riccardo Rosso who designed both Piper in Turin (1966) and L’Altro Mondo in Rimini (1967). Florence was home to Superstudio’s Mach 2 (1967) and Gruppo 9999’s Space Electronic (1969). Inspired by New York’s Electric Circus club and Marshall Mcluhan’s media theories, Space Electronic hosted everything from performances by Living Theatre to a vegetable garden. In Milan Ugo La Pietra designed Bang Bang (1968), a disco entered through a boutique, while on the Tuscan coast Gruppo UFO designed Bamba Issa (1969), a Mickey Mouse-inspired disco. These pioneering spaces united innovations in art, architecture, music, theatre and technology. They represent some of the only built examples of Radical architecture. Yet the phenomenon was short-lived, by the mid-1970s most had closed or been transformed into more commercial spaces. At a time when Radical Design’s legacy is being reconsidered and nightclubs are closing across the UK, this presentation explores the relationship between avant-garde architecture and nightlife, and its significance today. Co-curated by Dr Catharine Rossi (Kingston University London) and Sumitra Upham (ICA).